About the Queen Elizabeth II Stadium After a gap of ten years, Enfield Town finally returned “home” in November 2011 when conversion work on the athletics stadium in Donkey Lane was complete. Three sides of the ground are nothing special – two covered “temporary” terraces behind the goals (although inside the track thankfully) with a small seated stand on the far side of the pitch. 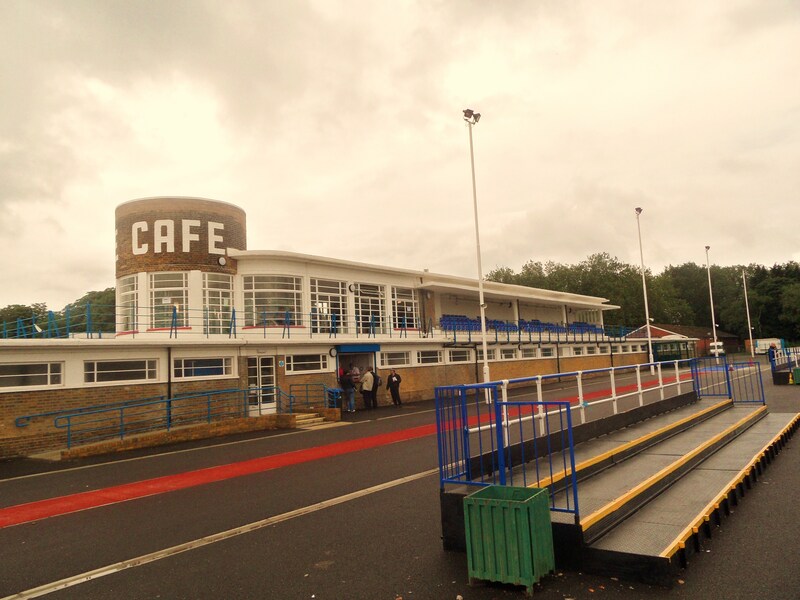 But on the other side is one of the most iconic buildings in Non League football. The Art Deco main stand is certainly striking and the focal point of the ground. It is set a long way back from the pitch but there is a 1st level stand with seating for a hundred or so as part of a terrace, along with a cafe/bar at one end. Underneath are the club offices, changing rooms and food serving areas. How to get to the Queen Elizabeth II Stadium The QE Stadium is well served by buses so there should be no problem getting here by public transport. Please consider using public transport as your first choice and only come by car if necessary. From Enfield Town Station: Come out of the station and cross over Southbury Road. There are two bus stops, both of which you can use. The 317 bus will take you to the ground. Get off at Cambridge Gardens. Walk down Cambridge Gardens and this leads into Donkey Lane. If you fancy a walk through the park take one of the following buses. 121 towards Enfield Lock 191 towards Edmonton Green 307 towards Brimsdown 313 towards Chingford 317 towards Waltham Cross 231 towards Turnpike Lane Get off at Percival Road, head up Bryn-y-Mawr Road, turn left and then first right. This takes you into the park and the QE Stadium is at the other end of the path. If you intend to walk across the park, take notice of the closing times by the gates. The park is locked at night. The most direct walking route from Enfield Town station is down Southbury Road and turn left into Ladysmith Road. Follow this until you reach the footpath on the right which takes you to the stadium. After a game turn right out of the Stadium to head off down the path in the opposite direction. From Enfield Chase Station Come out of the station, turn right and go under the bridge, turn left at the main junction into Chase Side and the Enfield War Memorial bus stop (stop CD) is on the left. The 191 heading towards Brimsdown from Enfield or towards Edmonton Green from Brimsdown stops outside the ground. Buses leave every 8 to 11 minutes Mondays to Saturdays and the journey should take about 12 minutes. Get off at Baynes Close, head towards the Cambridge Road (A10) and Donkey Lane will be on your right. You can also take the 231, 307 or 313 which go past Enfield Town station or walk down to Little Park Gardens to pick up the 317. From Southbury Station:- Turn left out of the station, cross over Southbury Road and go to the Baird Road bus stop (stop Q). You can pick up the 217 or 317 to Waltham Cross from there. Get off at Cambridge Gardens which is four stops from Baird Road. Walk down Cambridge Gardens and this leads into Donkey Lane. From Brimsdown Station Come out of the station on the opposite side to the retail development and McDonalds. Turn left to get to the bus stop. Either take the 191 towards Edmonton Green and get off at Baynes Close, head towards the Cambridge Road (A10) and Donkey Lane will be on your right. Otherwise, take the 307 towards New Barnet and get off at Baird Road (two stops after Southbury Station). Cross over the road to get the 217 or 317 towards Waltham Cross and take that to Cambridge Gardens. Walk down Cambridge Gardens and this leads into Donkey Lane. If you are driving from the M25, head towards London on the A10 from junction 25. Turn right into Carterhatch Lane at the Halfway House pub. Donkey Lane is first left after the pub. There is plenty of free parking outside the station. If you are coming via North Circular or from central London, head north up the A10 and turn left to Carterhatch Lane at the Halfway House pub. Donkey Lane is first left after the pub. Admission to the Queen Elizabeth II Stadium This season Adult admission will be £9, Concession entry will be £5 and Under 16’s will be charged £1. Programmes are available inside the ground for £2. Our last visit – July 2012 Apart from my trip to the dark side a few weeks ago to watch the New York Red Bulls, my season ended over two months ago. Last season I managed to shoe-horn in 104 games in 14 countries between 1 July and 7 May. Nine weeks is a lifetime in football. But finally we had football back in our weekends. Our first game of the season ticked so many boxes. Lewes game; new ground and the chance to win our first bit of silverware for five years. Bring on the Supporters Direct Shield! Supporters Direct do a fantastic job across all levels of football. Many fans of the likes of Arsenal, Manchester City or Chelsea will probably never have heard of them. But they work tirelessly in helping clubs rebuild and create sustainable business models for the future. They have focused their efforts on clubs who have gone through financial “trauma” but their assistance is available to everyone and to celebrate their work each year they hold a conference where clubs, fans, members, owners and just about anyone who cares about the game attends. Last year it was in Chester and had an address from William Gaillard, UEFA’s Director of Communications no less at the conference. This year it was the turn of London to host the show. The highlight of the event is the Supporters Direct Cup which is contested between two clubs that are owned by their members. In the past this has featured AFC Wimbledon, FC United, Chester and Brentford. Two years ago they also added the Supporters Direct Shield as a double-header to make the event even better. Participation is by invite and Lewes were lucky enough to receive their golden ticket back in March to take part. With over 800 members now about to renew their faith in the Rooks for the first time it is clear to see the benefits of a community ownership model – after all who wouldn’t want someone like me on their board! Lewes would be playing Fisher, whilst Enfield Town would be taking on Wrexham for the Supporters Direct Cup. It was fitting that the venue for the festivities was Enfield Town’s new(ish) ground at Donkey Lane. The Queen Elizabeth II Stadium to give it its full name opened it’s doors to football in November 2011 after the Towners eleven years nomadic existence. Enfield Town, as I am sure you know from reading David Hartrick’s excellent book 50 Teams That Mattered, were the first ever supporter-owned club. They made the mould that the likes of FC United, AFC Wimbledon and of course Lewes are now following. As Benjamin Franklin once said, “Out of great adversity comes opportunity” and that is the story of Enfield Town’s existence. Back in the day Enfield FC were one of the most feared Non League teams around. They won the Conference in 1983 and 1986 as well as the Trophy in 1982 and 1988. Today they would be promoted into the Football League (in fact in 1987 they would have been promoted as the system we have today was brought in), but back in the 1980’s it was up to the League clubs to determine if a non league club could and would be voted in. Consequently, teams like Enfield, Altrincham and Wealdstone never got the chance whilst the likes of Rochdale and Torquay United propped up the rest of the Football League. The story then turn an all too predictable turn. The club was sold, ambitions were unrealistic, financial meltdown ensued. In Enfield’s case they actually split into two, with Enfield 1893 and Enfield Town going their separate ways. The latter have now climbed back up the leagues and this season will play in the Ryman Premier, at last after years of groundsharing with Brimsdown Rovers and Cheshunt, in their own stadium, the Queen Elizabeth II Stadium whilst their old ground is now a Cineworld. Our opponents Fisher had also been through the mill in recent years. Twenty five years ago the club were playing in the Conference National and were the “premier” non league side in London. But chasing the dream of league football ultimately cost their ground in Bermondsey, their Conference place and ultimately their own existence. 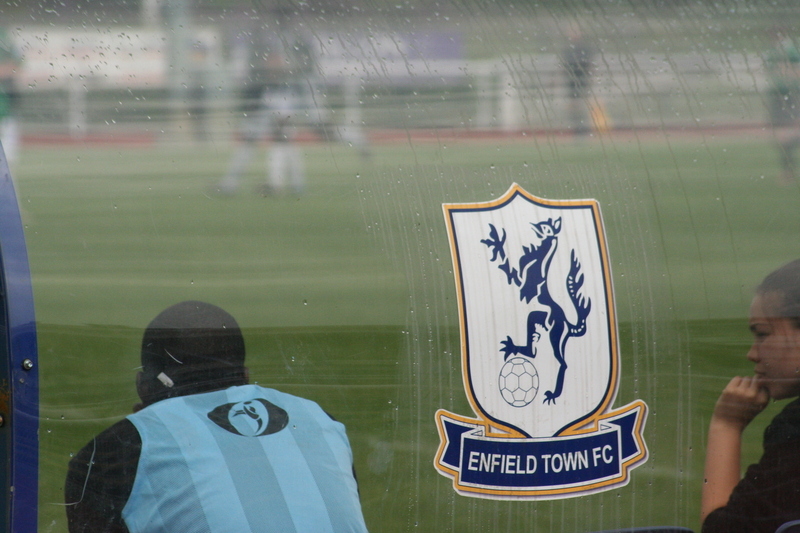 Like Enfield Town, they reformed a few years ago when the dawn was at its darkest and are now climbing back into the sunlight. Last season they finished 10th in the Kent League, reformed and stronger under Supporter ownership. This was to be the first of a demanding pre-season for Lewes which will see them play ten games in just five weeks. The squad was slowly taking shape with player-manager Simon Wormull retaining the services of some of the stars of last season including Nathan Crabb and Chris Breach. But there were also some new faces including the likes of Carl Beckford and part-time model Jay Conroy. The team(s) were introduced to the public on the day before the game at the club’s Open Day, proudly showing off their sparkling new SpecSavers sponsored kit. At 11am there were some serious doubts that the game would not go ahead. Rain had pounded South East England since the early hours and we were staring at an almost unheard of pre-season game cancellation (well, apart fromDanny Last’s trip to Winchester City v Havant yesterday that was abandoned at half time). This should have been an easy trip around the North Circular but the rain had flooded the Dartford Tunnel (that’s not worrying at all – a tunnel under a major river flooding), the roads north of the Blackwall Tunnel were being designated as “Olympic Lanes” (oh how commuters will laugh at the chaos that will cause) and shoppers were driving aimlessly around Stratford looking for a car park for Westfields (as the main ones have been closed to stop people parking there for the Olympics – the bare-faced cheek!). But we arrived in time to see the squad being put through their paces in the park opposite the ground. Worm’s had brought a squad of 18 with the intention of trying out as many as possible. 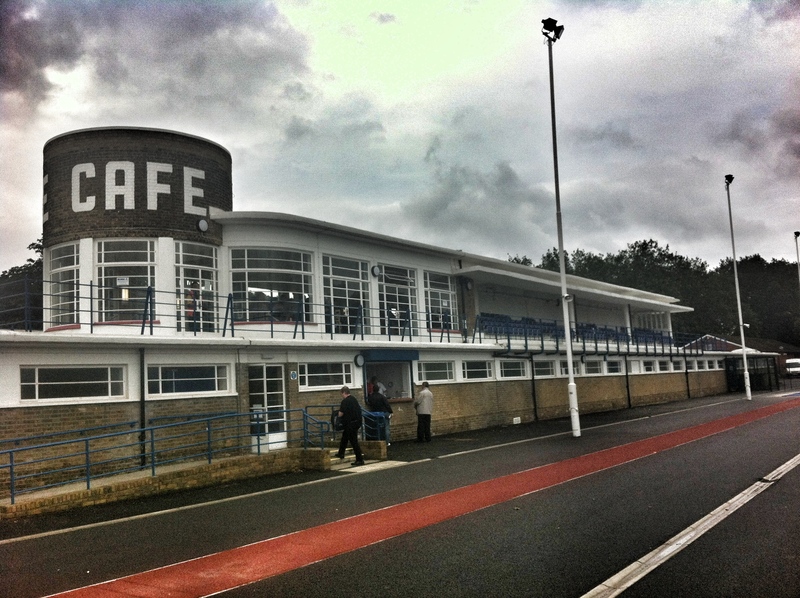 We headed inside the magnificent main stand and up to the cafe for a swift half, bumping into Non League Day’s Mike Bayly spreading the word of this year’s event on Saturday 13th October as well as the Dagger’s Diary team, Brian, Dan and Liam. It seemed the “floating” fans outnumbered the Lewes fans – not a good sign for the season to come. Fisher 0 Lewes 1 – Queen Elizabeth II Stadium – Sunday 8th July 2012 So our first game of the season saw the Rooks take home their first silverware in five years. It wasn’t a classic – few opening games in pre-season are, but the squad weathered the torrential rain, hot sunshine and the occasional clap of thunder to beat a determined Fisher side. The only goal came just after the break when a hotly contested Lewes corner was swung over by Beckford and Chris Breach showed why he is still one of the best attacking centre-backs in Non League football with a towering header into the net. I for one could breathe a sigh of relief thanks to Breach’s excellent header. To demonstrate the importance of fan involvement in their team’s progress drawn games in the Supporters Direct cups are decided by a fans penalty shoot out at half time. So if the game is heading for stalemate, both teams will know who will be crowned the winner. So at half time I donned the keeper’s gloves to see if I could save more than Joe Hart and win us an advantage in the a game. Alas, the theory that the side that misses first goes on to win did not hold true as I missed my spot kick, although I redeemed myself by saving the next one. However, young Sam’s miss in the final spot kick meant it was advantage Fisher going into the second half. You can relive the drama of the spot kicks here. After a very tight first half and the drama of the spot-kicks we headed inside for a beer. Unfortunately, the crazy licencing laws in this country meant that because Wrexham were playing later in the afternoon, alcohol could not be taken out of the bar area and onto the terrace. This was despite the fact Wrexham had brought down an under 18’s side. If ever there was a law that directly impacted the ability for small clubs to make money, this is it. No more than 100 fans were watching this game, yet the licencing laws are the same as if it was a 90,000 capacity game at Wembley Stadium. The second half was punctuated by a number of stoppages for substitutions. Simon Wormull brought himself on after an hour and came the closest to scoring with a couple of long range efforts that the Fisher keeper(s) had to get down well to save. 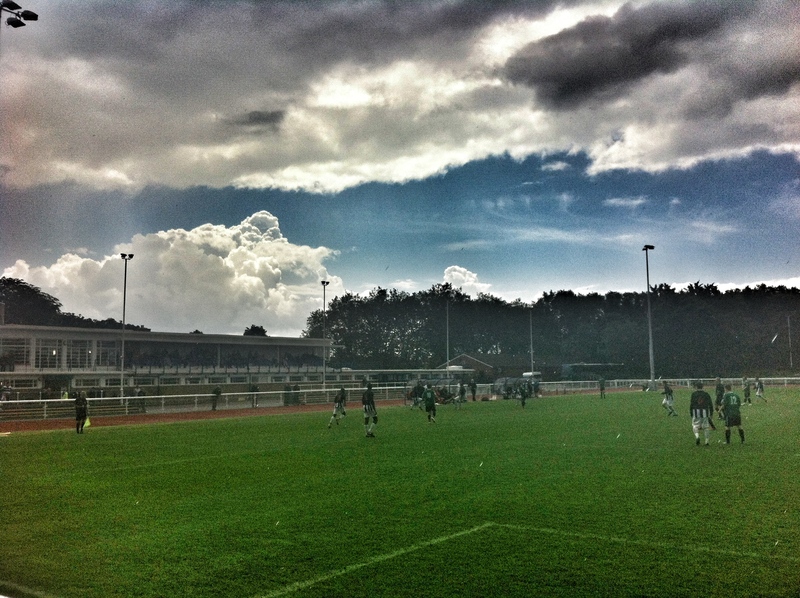 As the bright sunshine was replaced by more torrential rain the referee blew the final whistle. 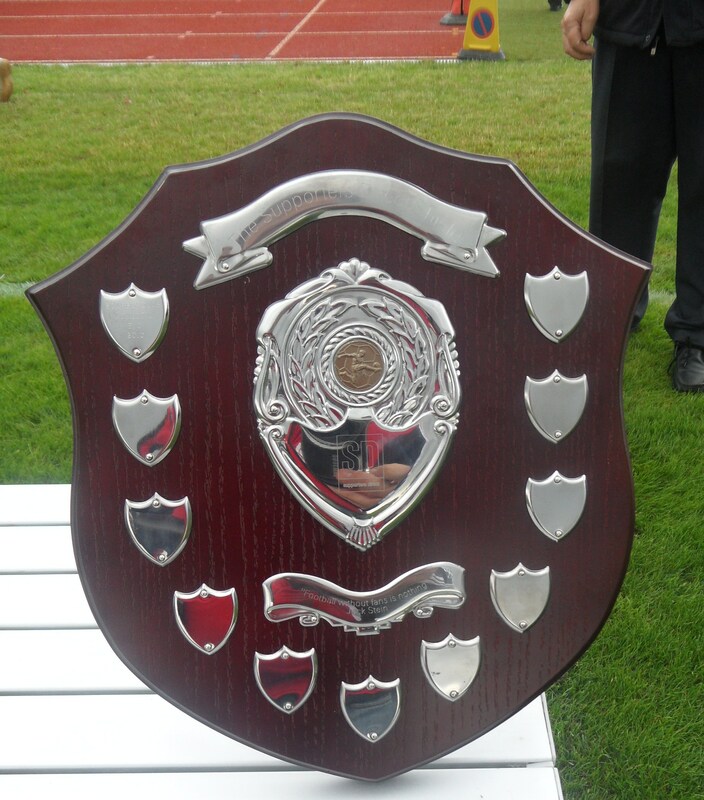 Lewes had won the Shield that had been held for nearly two years by Scarborough Athletic. There was a small presentation to skipper Steve Robinson and time for a quick team photo before the players left the pitch. This is obviously early days, but pre-season games are all about the performance and there can be few complaints about the Rooks efforts in this game. Lewes finished last season with 8 wins from 10 games and so it was important to get back on the winning bike as soon as possible. For me, well it was game number one of the new season. 105 is a tough ask, but we will have a go at beating it! More pictures can be found from the afternoon here.